This time last year (or so), I posted an article on upgrading your T-Mobile Dash phone to Windows Mobile 6.1 – the latest WinMo build available for these phones. While that article is still very valid and useable, I thought it best to revisit this topic with more current information, including the WM6.1 ROM that I’m now using. I’ll be rehashing much of the info from my previous post (no sense reinventing the wheel!). That said, this article should be able to get you from your current state (WM5, WM6 or WM6.1) to the Windows Mobile 6.1-based “EnergyROM”, which I’m liking very much. Even better, many of the tweaks that I posted in my previous article are no longer necessary – they’re built right in! First of all, this write-up assumes that you have a fully-functioning T-Mobile Dash phone operating on the U.S. network. It also assumes that you know how to use your phone fairly well, as not everything is spelled out for you. Lastly, this procedure may void your warranty, so please be aware of that. 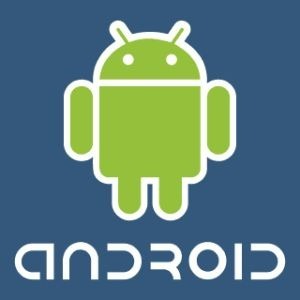 To download this ROM file and unzip it to a local folder on your computer. The desktop works fine. 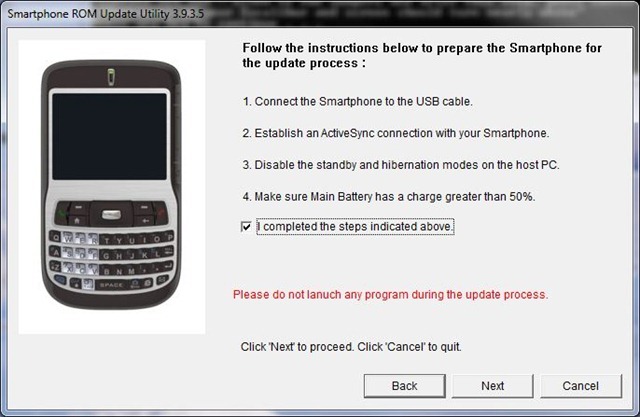 Turn off your phone, remove any MicroSD card you might have, and boot the phone back up again. When the phone is fully booted (and usable), connect your phone to your PC via your USB sync cable. 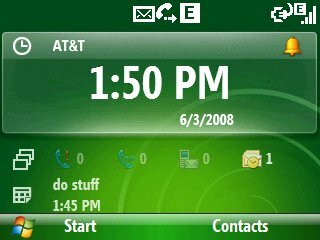 Windows should recognize your phone and either 1) launch ActiveSync/Windows Mobile Device Center (pictured), or 2) see it as a removable drive. Fine. Things are working normally. 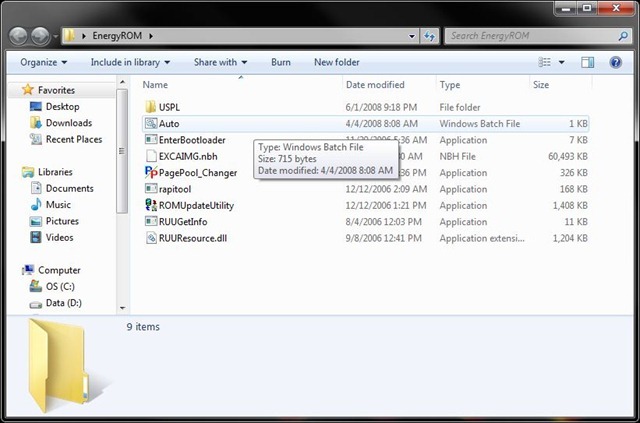 With your phone connected to your PC, double-click on the “auto.bat” file from the EnergyROM .rar file that you downloaded/extracted in the earlier steps. 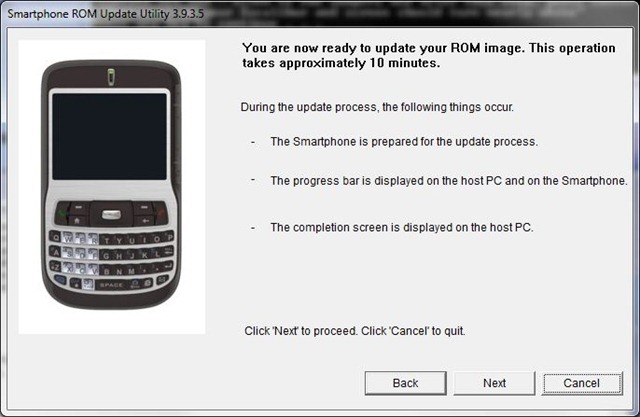 The ROM update utility will start. 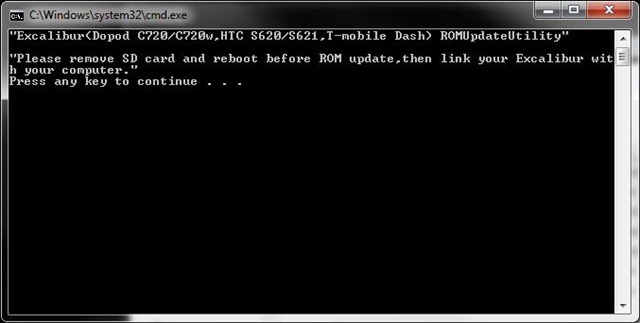 You should be greeted with a command prompt box telling your to “remove SD card and reboot…”. We’ve already done this, so hit Enter (any key) to continue. The ROM will be copied to your phone. The screen should read “execute SPL now…” Hit Enter one more time. Now, hit the middle (silver) button of your phone d-pad. The screen on your mobile phone should turn white. Back at the CMD prompt (DOS box), hit Enter once more to continue. 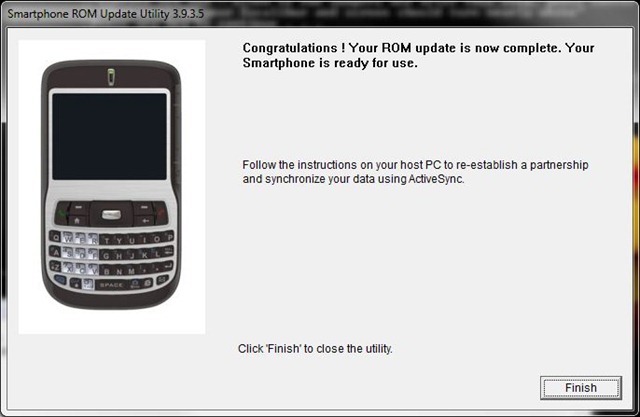 The GUI for the ROM updater should launch. Keep the defaults and select any “I agree” statements when prompted. The ROM update itself takes about 5 minutes or so. Update successful! After the update, your phone will reboot by itself and run some behind-the-scenes configurations, which might take awhile. This is normal. 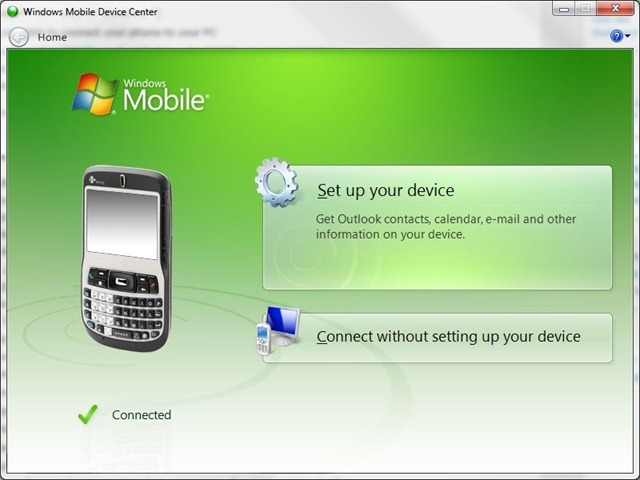 Upon rebooting again, you will see the Windows Mobile desktop, which is followed up shortly by the “Connection Setup” dialog. Choose your cellular operator and hit OK to apply those settings. For whatever reason, this ROM update sets your time, date and time zone quite strangely, which may adversely affect some program installs. So, go ahead and set those settings now. Go to START > SETTINGS > Clock & Alarm > Time & Date. Finally, your phone should be ready-to-go with the WM6.1 EnergyROM. Congrats!!! You can re-insert your MiniSD card, if you like. Although this ROM comes with a newer version of the mobile Internet Explorer browser, it leaves some things to be desired. I’ve found that the (free) Opera Mini browser is very nice to use on these phones, can browse most any website, and is really quite fast – even over the Edge network. Here’s how to install Opera Mini, if you like. Hold the backspace arrow to delete the current text. On the next page, select the top option for “Download Opera Mini! (English, Multiple Certificates)” and hit the center button. Click the left soft button to Continue. Click OK at the <root> option prompt. Click Continue again. Opera Mini will download and install. Click YES to launch when prompted. Click YES at the initial Permissions screen for Opera Mini. At the Permissions screen, select “Yes, always. Don’t ask again” and hit OK to continue. Opera Mini will finish its install. Click “Accept” and you’re done. Finally, within Opera Mini, choose Menu (left soft button) > Tools > Settings. Deselect the “Auto-complete address input” and “24-hour clock” options. *Highly recommended*. Hit the left soft button to Save. 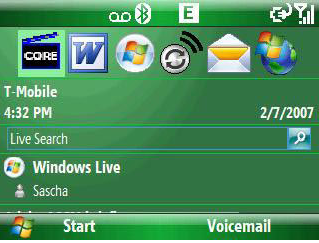 Note: Opera Mini is a java application, so you won’t see an ‘Opera Mini’ link on your Start Menu. Instead, launch the Java application, and then launch Opera Mini from within it. You can assign a hotkey to the Java app, or use MortScript to make Opera Mini its own “program”, so to speak. More on that in the near future. The T-Mobile Dash continues to surprise me with how well it performs after all these years. Hey… this sucker was originally released in late 2006! The continuing dev support, especially at XDA Developers, is nothing short of astounding. Even better, the EnergyROM has breathed additional life into this phone, which is really cool. It looks great, is a bit faster, handles low-memory situations better, and incorporates a lot of the tweaks I really love. Very nice work, NRGZ28!! Migrating to the G1 phone? Before I talk about the G1 too much, I should give a bit of a background here. I’ve been using this T-Mobile Dash since November 2006. Quite honestly, it’s been a very good phone. Perhaps the best I’ve ever owned. At one point, I had gone over 90 days without ever restarting, rebooting, or turning off the phone. That’s amazing! 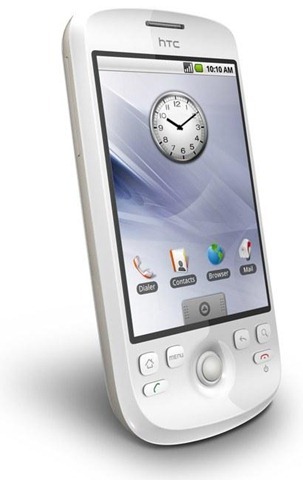 The Dash initially shipped with the (fairly painful) Windows Mobile 5.0 OS. 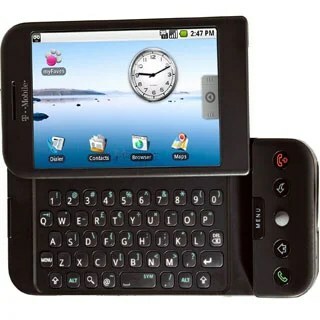 Before too long, T-Mobile and HTC (the phone manufacturer) offered a free/supported upgrade to WinMo 6.0. The offer of a free OS upgrade for your mobile phone was pretty amazing at the time. 6.0 was better in most regards. This year, a “gray” release of WinMo 6.1 became available, and it was a very worthy upgrade for the Dash. Still, an OS refresh can only do so much for an aging phone. 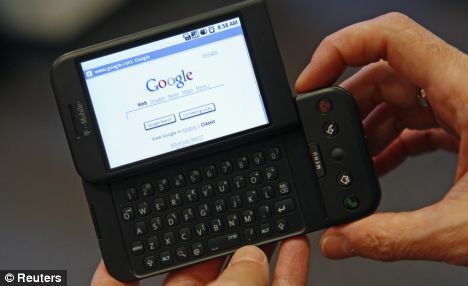 I’m actually not enormously excited about migrating to the G1 phone. Why? Well, primarily because I’m very aware of some functionality that I’ll be losing. For starters, the G1 does *not* yet support Exchange sync capability, which is something I’ve been using for 2 years now. Also, there are some seemingly small features that it lacks, and I’m always amazed that new, state-of-the-art phones don’t have these. 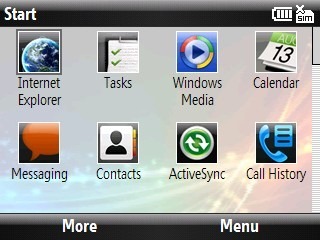 First, my Dash (WinMo OS) has a ring profile called “Automatic”. In this mode, the phone would automatically set your phone to “silent” when you were in a meeting. It gathered this information, of course, from your phone calendar, which was synced with my work calendar. When the meeting was done, the ringer went back to “normal” ring mode. Have you ever set your phone to “vibrate” and then missed a call because you forgot to put it back? I used to do that ALL the time, but not since having this feature. Honestly, every phone with a calendar should have this feature. It’s a no-brainer to me, but it appears that only Windows Mobile has figured it out. Secondly, my default ring “style” has for years been vibrate first, then ring. Assuming that my phone is on my person (or near to me), this gives me about a 90% success rate of grabbing my phone and answering it before anyone has to hear the ring tone. I guarantee that my co-workers are more than happy to not have to hear yet another phone ringing in the office. How many phones offer the vibrate first, then ring option? Not many, and apparently *NOT* the G1. Aggravating. Thirdly, the Dash features an in-your-face style keyboard, whereas the G1 is a fold-out style. Any typing on the G1 will require flipping the screen aside to access the keyboard, since it does *not* (currently) have any sort of a virtual keyboard. That, of course, allows for a much bigger screen, which is nice, but at the cost of less-accessible typing, in some regards. Not a deal killer, by any stretch, but notable. Lastly, I’m aware of some other features that I’ll be losing – at least for now. “Phone tethering”, which allows me to use my phone as a modem for a laptop, is not available on the G1 right now, as I understand it. Full “Office files” support is also not available (or just not “built-in”, perhaps), which means that easily opening/editing Word and Excel files is not an option. Hmph. The list goes on, I’m sure. + Keyboard is (so far) pretty easy to use, and even has two shift keys! + Holding a desktop icon allows you to move it or delete it. Cool! + 3G network is nice n’ fast! – Battery life is pretty poor, it seems. Maybe I’ll get a day and a half?! – Keyboard seems slightly angled when opened. Strange. So… that’s all for now. I need to man-handle this phone for a week or two to *really* get the low-down on it. I know that my brother is interested in one as well, so I’m going to try and put it thru its paces. More on the G1 soon! NOTE: A newer version of this article is posted here. I’ve been a T-Mobile customer for years (and years). In fact, I’ve been a T-Mobile customer for as long as they’ve been active in the United States. Before that we were with Voicestream , the company that T-Mobile bought out to stake a claim on American soil. During that time, of course, we’ve had several phones. An early Handspring PDA with a phone add-on that made me look like I was talking into a pizza box. A couple of Samsung phones. A Nokia 6820 that my wife still uses. And there were other phones, I’m sure. In November 2006, however, I waded reluctantly into the Windows Mobile world. Not because I wanted a Windows Mobile-based phone, mind you, but because I was beginning to support them in the workplace on a regular basis. It just made sense. Most of our company is on AT&T, but I staunchly demanded to stick with T-Mobile. 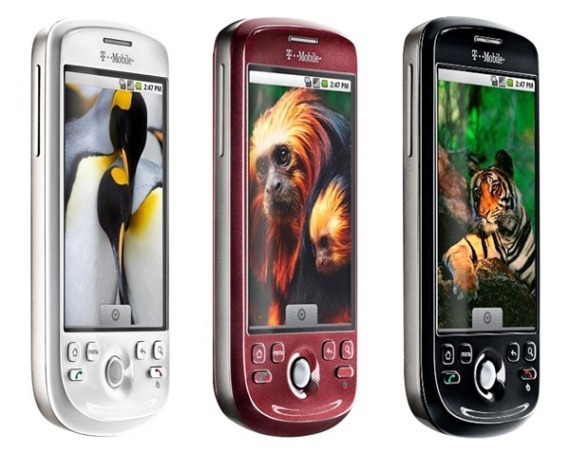 That being the case, my choices of Windows Mobile-based phones was limited. Not too limited, however, as I was able to purchase the T-Mobile Dash for not-too-much money. The point of this article is to help others upgrade to the very latest OS that you can find for the T-Mobile Dash: Windows Mobile 6.1 (WM6.1). Although these phones initially shipped with WM5.0, T-Mobile (and HTC) eventually offered a free, supported upgrade to WM6.0. It was a nice move on their part, and a worthy upgrade. Upgrading from WM6.0 to WM6.1 seems almost trite, but make no mistake about it: upgrading to WM6.1 is a radical front-end change that will leave you feeling like you have a brand new phone! Perhaps that’s overstating it a bit, but the upgrade is really quite nice to have. Enough of all that. Let’s try to get you upgraded! To download these zipped files and unzip them to a local folder on your computer. The desktop works fine. Turn off your phone, remove any MicroSD card you might have, and boot the phone back up again. When the phone is fully booted (and usable), connect your phone to your PC via your USB sync cable. Windows should recognize your phone and either 1) launch Active-Sync, or 2) see it as a removable drive. Fine. Things are working normally. 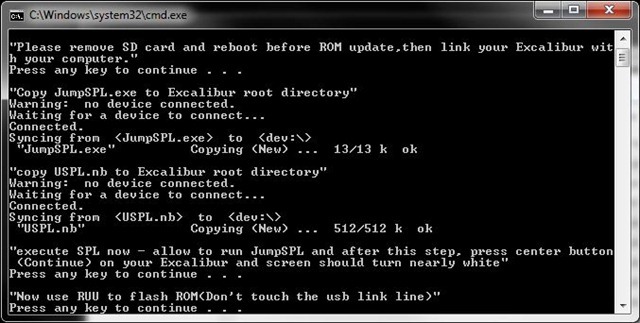 With your phone connected to your PC, double-click on the "RUU_Excalibur_WM61_Kavana_080330_WWE.exe" file that you downloaded/extracted in the earlier steps. 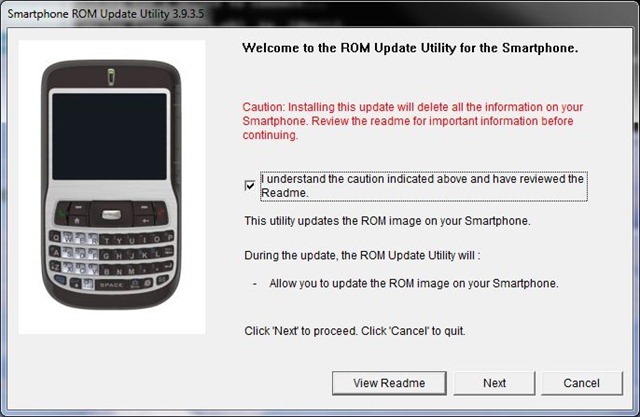 The ROM update utility will start. Click the button with "EC" to continue. You should be greeted with a command prompt box telling your to "remove SD card and reboot…". We’ve already done this, so hit Enter to continue. The ROM will be copied to your phone. The screen should read "execute SPL now…" Hit Enter one more time. Hit Enter once more to continue. The GUI for the ROM updater should launch. Keep the defaults and select any "I agree" statements when prompted. The ROM update itself takes about 5 minutes or so. 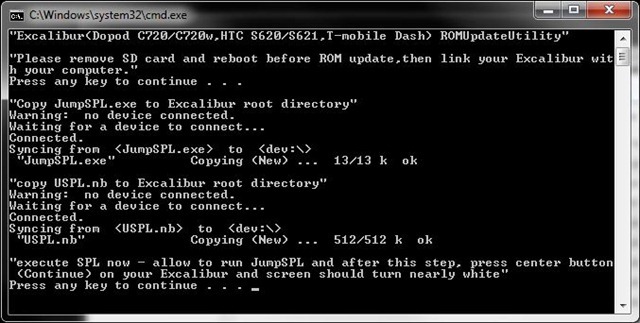 After the update, your phone will reboot by itself and run the ‘Cold Boot’ config. This is normal. Restart your phone when prompted. Upon rebooting again, you will be prompted with a "Voice Command" program selected. I chose "Microsoft Voice Command" and clicked OK. Another reboot. 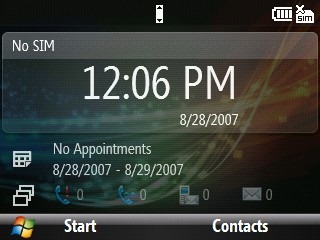 Finally, your phone should boot up into the new WM6.1 interface and join the T-Mobile network. Congrats!!! Your phone has successfully upgraded. You can also turn the phone off again and re-insert your MiniSD card, if you like. This ROM defaults to an alternate (non-US) keyboard mapping for this phone. It’s fairly easy to fix, so here we go…. Copy the ‘ET9 Full.cab’ and ‘et9.Excalibur.0409.kmap.txt’ files to your phone. Remember where you put them! Using the File Explorer, find the ‘ET9 Full.cab’ file and launch it to install. Install it to your ‘Device’, if prompted. Under Start > All Programs, use the Resco Explorer program to copy the ‘et9.Excalibur.0409.kmap.txt’ file to the My Device\Windows folder on your phone. Overwrite the existing file. Restart your phone and enjoy the proper keyboard mappings! 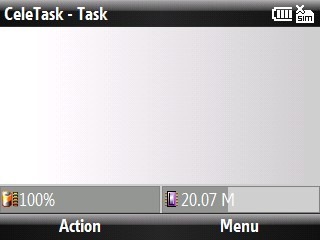 Note: the pink "T" button in the lower-right hand corner of the keypad now launches the CeleTask task manager application. Very nice! Go to the Start menu on your phone. This selection now opens the "Recent Programs" option by default. Hit the left soft button again for "All Programs", then select Accessories. Select the ‘United States’ from the first drop-down menu, and then ‘T-Mobile’ as your operator. 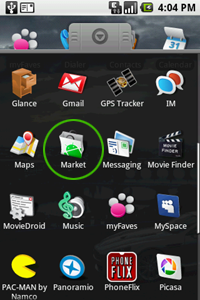 Your phone should now be configured for T-Mobile phone, data, MMS, and SMS access. The default typing input method for the Dash is the Xt9 I’m-gonna-guess-what-you-really-mean-to-say method. I find it aggravating and turn it off immediately. Here’s how. Now you can type what you want, how you want. This selection will stay even with a reboot! The Dash features a touch-sensitive strip just right of the display. It’s called the JogBar, and I hate it. Actually, I like the idea, but it really doesn’t work well if you hold the phone up to your head with your right hand. What happens? Basically, it touches the side of your face and ends up turning the volume down in mid phone call. Ooops! For whatever reason, they *never* thought to include another method for adjusting the volume on these phones. How about the up/down d-pad, guys? Crazy, I know. Copy the ‘SetJogBar.cab’ file to your phone. Remember where you put it! Using the File Explorer on your phone, find the ‘SetJogBar.cab’ that you copied over and run it. Install it to your ‘Device’, if prompted. Next, make a quick phone call, use the JogBar to turn the phone up all the way, and disconnect the call. Go to Start > All Programs > and Settings on your phone. On the 3rd screen, find the JOGGR line, open it, de-select the top 4 checkboxes, and click done. Copy the ‘ms_mobile.gif’ image to your phone. Again, remember where you put it. Using Resco Explorer (Start > All Programs), copy the ‘ms_mobile.gif’ file to the My Device\Windows folder on your phone. Overwrite the existing file. 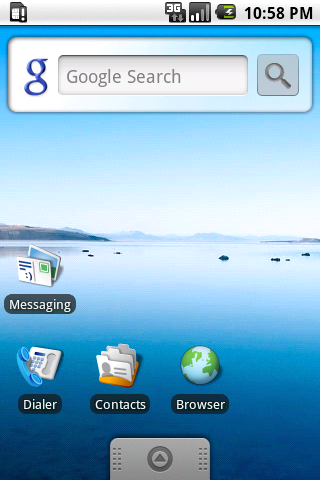 Reboot your phone and you’ll notice a handy ‘numbers + letters’ graphic at the top of the screen when you start dialing. Cool. On your phone, go to Start > All Programs > Settings and choose Home Screen. The first option is called the Home Screen Layout and defaults to "Sliding Panel Media". Select that box, and hit right or left on your d-pad until it says "Sliding Panel" only. You’ll also notice a checkbox that says "Show Recent Programs". If you prefer that the Start button shows All Programs (instead of the new default Recent Programs), then simply uncheck that box. Hit Done and then hit the Home button. Your home screen will be changed! For more information on your T-Mobile Dash, check out the XDA Developers "Excalibur" message board. Really great stuff there!